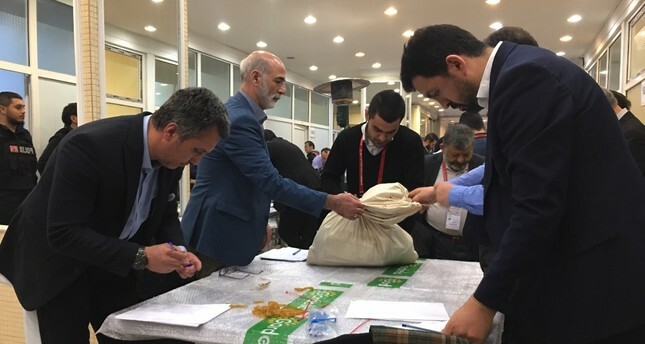 Representatives from the YSK and political parties recount invalid votes of the March 31 elections in Şişli district, Istanbul, April 5, 2019. The ruling Justice and Development Party (AK Party) emphasized that it is pursuing allegations of voting irregularities in the March 31 elections, while closely following the post-election period activities of the country's top election body so the ultimate result reflects the people's will. "Currently, the votes difference [in Istanbul] has decreased to 16,442 from 29,000," AK Party Deputy Chairman Ali İhsan Yavuz said yesterday, referring to the process of recounting invalid votes and investigating irregularities in the elections. Yavuz added that they would resort to asking the election board to recount all votes in all districts of Istanbul to completely clear suspicions concerning the election. AK Party spokesperson Ömer Çelik also told reporters yesterday that the appeal process continues and the party sees the Supreme Election Council (YSK) as the sole authority to decide definite results in the elections. "After all elections in Turkey, political parties object [to results] and the YSK decides on results. Regardless of the outcome, we will respect the result declared by the YSK," Çelik said. On March 31, millions of Turkish voters cast votes in the local elections to choose Turkey's mayors, city council members, mukhtars (neighborhood officials) and members of elder councils for the next five years. The appeal and objection process followed Election Day as many parties were determined to exhaust all appeals and move the election results to the YSK in some other election districts. In relation to the appeal process, Çelik stressed that it is a normal situation, noting some 57 million voters cast votes in close to 195,000 ballot boxes; thus, it is natural to have some objections and appeals. Touching upon the performance of his party, Çelik said: "The turnout was 85%, which is historic. The People's Alliance got 52% of votes, while the AK Party got 45% of the votes. This is an election where we ranked first for the 15th time." The contentious objection process in Istanbul, the commercial capital and the most populous city in Turkey, continues as invalid votes in all Istanbul districts are being recounted, while all votes are being reassessed in four districts. Muharrem Erek, deputy chairman of the main opposition Republican People's Party's (CHP), announced yesterday on his official media account that the difference between CHP candidate Ekrem İmamoğlu and AK Party candidate Binali Yıldırım had been reduced to 17,111. The unofficial results showed İmamoğlu leading in the mayoral race in the Istanbul Metropolitan Municipality against Yıldırım, who was deemed the favorite by many in the race ahead of the elections, by a small margin of about 22,000 votes. There were 10,570,939 eligible voters, and voter turnout was 83.88 percent. However, of nearly 9 million voters, 319,540 were declared invalid votes, mainly in districts considered to be AK Party strongholds. Additionally, there were significant discrepancies among the tabulated results with wet signatures and stamps, which show the first vote record, final record and total number of votes submitted to the YSK. As a result, following application to district election boards, the AK Party Istanbul provincial organization applied Friday to the Istanbul provincial election board for a total recount of all votes cast in the province in the local elections. Not only Istanbul but also objection and appeal processes have been initiated throughout the country while some processes have been completed in certain districts. In western Kırklareli province, the YSK, the highest authority evaluating objections regarding elections, announced on Saturday that independent candidate Mehmet Kesimoğlu had been elected as mayor of Kırklareli after assessing the objections of the AK Party and the Nationalist Movement Party (MHP). According to definite results, Kesimoğlu garnered 37.48 percent of the votes, while the MHP had 36.94 percent of the votes. Kesimoğlu was leading the mayoral race according to provisional election results on March 31, leaving his rival MHP candidate Derya Bulut behind with a 248 vote difference. Kesimoğlu was a former member of the CHP, but he resigned and became an independent candidate in the province after the party refused to nominate him as their mayoral candidate. The provincial election board in Denizli's Honaz district announced on Saturday that CHP candidate Yüksel Kepenek had won the elections, surpassing his rival AK Party candidate Turgut Devecioğlu by 1 vote. Devecioğlu asserted that 1 vote does not fully reflect the will of the people, and he will apply to the YSK to re-evaluate the votes again. Kepeneki, on the other hand, insisted that he would become the mayor of Honaz even if the votes were recounted for the fourth time. Meanwhile, AK Party objections in the Babadağ district of Denizli where the party lost by 15 votes and far-right Good Party (İP) objections in Denizli's Balkan district where the party lost by 7 votes were rejected by the district election boards. The number of votes between AK Party and MHP candidates decreased to 147 in Bartın province following the re-counting of valid votes by the provincial election board at the request of the AK Party. MHP candidate Cemal Akın remained the leading candidate in the mayoral race, ahead of AK Party candidate Yusuf Ziya Aldatmaz. On Friday, the provincial election board decided to re-count 5 out of 154 ballot boxes; however, the re-evaluation only changed 1 vote. In relation to the issue, Akın highlighted that a change of 1 vote only proved that he is the mayor elected by the will of people.